Canadian Big Buzz Green Machine Energy Drink is a popular energy drink in Canada. When you become as obsessed about energy drinks as I am, you find yourself traveling to distant places with energy drink hunting at the top of your to-do list. For this past New Year’s holiday, I went to Canada. Amidst the blistering cold, high tourist prices, and crowded everything, I found an energy drink collector’s dream in a little convenience store. This is one of the highlights of that treasure find. The taste? It’s like a new spring rain falling from a rainbow that is slowly blending its way into a golden sun-tinged horizon; every drop of rain a reassurance of the prosperous and joyous season ahead, full of delight and happiness. Ya feel me? Can ya dig it? Truthfully, that rain would probably still taste like water. However, if you let your imagination run with me, that’d be some pretty smooth tasting rain and that’s exactly how to describe the taste of this drink. Smoooooth! It has a light berry taste reminiscent of Full Throttle Blue Demon, and the experience fades as soon as you swallow, without a lingering grapefruit-ish aftertaste bite so commonly found in other energy drinks. Everything’s pretty standard here (Taurine etc., you know the drill), with the addition of some extra B vitamins and a little C thrown in for good measure too. On the business end of the ingredients, there is an impressive 224mg of caffeine. What does this equate to? Well stop reading this paragraph and move to the next one. I’m serious. Go. Now. One word comes to mind: Holycrapthisdrinkhasakick! Yes, that’s a word. Look it up. Upon second thought, maybe just take my word for it. Seriously though, this drink lives up to its name and gives you a big buzz. It’s not too big either! This drink just simply got it right. Not so little that you can’t feel it and not so strong that you regret drinking it. Verdict: This perfect drink makes the top 5 of my rather extensive 300+ list. If you find this drink in your international travels, BUY IT. How Does Canadian Big Buzz Green Machine Energy Compare? 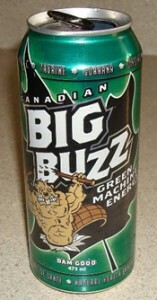 Canadian Big Buzz Green Machine Energy contains 14.00 mgs of caffeine per fluid ounce (47.34mg/100 ml).